If you were to choose the single most important act in history and then, choose the single most important person behind that act, who would you choose? Buddha, for teaching the Middle Way that ends suffering and leads to enlightenment? Jesus, for resurrecting and saving mankind from its sins? Mohammad, for insisting on the greatness and priority of God? Edison, for bringing light to human society? Gandhi, for his commitment to non-violent social revolution? While these achievements and individuals continue to stand as inspirational examples that awaken and uplift humanity, there remains a contribution transcends and includes all of these. Thomas Jefferson insisted that guarantees of individual liberties be made social law. The rights to free speech, press, assembly, and religion as well as the rights of the accused mean that humanity, and in particular the government, is required to behave in a humane, or mutually respectful way. A strong case can be made that this act has done more to curtail the abuses of government and religions while supporting the power of individuals to grow and live in freedom than any other action in the history of civilization. The advocacy of a bill of rights transcends the interests of any particular nation and accomplishes transformations in social justice that religion has failed to do despite centuries of the opportunities that power, and control provide. Jefferson’s insistence that human rights be guaranteed by federal law continues to reverberate throughout the world, changing it for the better, as more governments make similar statements the law of the land. However, many of these principles are yet to be acknowledged, absorbed, and widely supported. They remain under serious attack in many places, including in the United States. While having such laws by no means indicates their enforcement (China has a bill of rights), it does publicly announce to the world the standards by which a country wants to be judged in the way it treats its citizens. It sets the bar higher for both humans and government. Why is Jefferson’s contribution so monumental? He knew that, by its nature, power constantly appropriates more power to itself. He saw a bill of rights as a way to concretely limit the power of central government, which inherently has more power than individual citizens. His goal was to create governmental structures that restrain politicians from diminishing the freedoms of the individual while prohibiting citizens from denying liberties to other members of society. The establishment of such rights has made slavery illegal and unacceptable, brought voting rights to a growing number of women all over the world, and reduced faith-based discrimination by one faith against followers of others. The concept of basic human rights that require governmental protection do not only have social, cultural, and political ramifications. This principle also has extraordinarily powerful implications for our personal lives and how we govern ourselves. Imagine that who you are is something like an iceberg. An analogy would be to the political, financial, and corporate one percent which, through the constant accrual of privilege to itself, starves the ninety-nine percent of the population, whose consumption maintains the obscene and unjust wealth and privilege of that one percent. In time the rich, powerful, and status-conscious one percent collapses from the sheer weight of its own greed, selfishness, ignorance, and stupidity. A Jeffersonian response to this predicament would be to first recognize that the “citizens” that we govern are mostly disenfranchised and are functionally our slaves. We do not listen to them, nor do we grant them the right of free speech. We are not comfortable with the idea that there may be parts of ourselves that believe differently than we do, which means that there is no internal freedom of religion. Nor are we interested in groups of inner aspects getting together and acting in ways that we do not control, as happens in diseases like cancer, depression, and anxiety disorders. 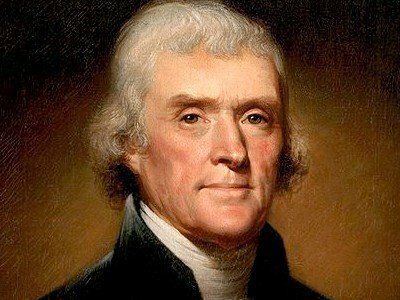 Jefferson believed all people are entitled to a bill of rights to protect them against any and all governments on earth. He believed that no just government should refuse such rights to its citizens. This has, since Jefferson’s time, a key criteria by which the justice of any government is evaluated. If it is the case that all governments, both general and particular, should guarantee such rights, doesn’t this mean that you, as the government ruling over your life, should extend the same to your own internal constituency? What would it look like if you were to do so for and to yourself, in particular, and if mankind were to do so, in general? To do so there must first be some means to guarantee basic freedoms of speech to your internal constituency. You must provide them with a way to be heard. In political terms the ability to have your voice be heard involves not only freedom of speech but the ability to petition the government regarding grievances, or injustice. On a personal level, what would such injustices consist of and what would a “petition” be? Integral Deep Listening listens to internal “petitions” when it treats dreams, nightmares, and life issues as wake-up calls generated by your larger internal and external identity. You learn to interview members of your internal constituency, called “emerging potentials,” that show up in your dreams and as personifications of the stressful feelings of your life issues. In this way freedom of speech is supplied to a sample of your internal constituency. It is similar to taking ice cores of the seven-eights of the iceberg that is below the water line. You don’t need to sample all the iceberg all the time to learn a lot about its condition. Internal “petitioning” of your waking identity is already happening all the time in your life. When you eat something that disagrees with you, your body petitions its “government” by complaining with a stomach ache or worse. When you mentally and emotionally attempt to “digest” something that is not healthy for you, like a horror movie, accident, or traumatic life event, your internal constituency petitions its “government” in the form of nightmares, bad dreams, troubled sleep, and increased waking anxiety. Such “petitions” are generally not accepted by the government, your waking sense of who you are, the ten percent of your iceberg self that is above water. The petitions of your internal constituency are ignored or put on a docket of complaints and then buried amid the pressure of ongoing waking priorities, similar to how the petitions of American Indians against the government were ignored, repressed, and denied for over a century. Addictions create other grievances, for which there are initially petitions that take different forms, depending on the imbalance. For smoking, the initial petitions take the form of coughing and throat discomfort. For drinking it might be a headache or throwing up. For eating too many sweets it might be a sense of agitation. However, there is soon established a strong internal constituency that benefits from, supports, and fights to defend the imbalance. Governmentally, this is similar to arms merchants, the NRA, the AIPAC (the American-Israeli Public Affairs Committee, which lobbies Congress for Israeli interests), drug manufacturers, bank, corporate, financial sectors, unions, churches, and anyone else that benefits from having their interests served at the expense of the majority. Similar internal interest groups form as addictions take hold. They then fight hard to maintain their power, presenting the addictive behavior that sustains them as normal, acceptable, necessary and even beneficial. Familial and cultural life scripts are powerful, universal examples of internal addictive cabals, grown so massive that they control the halls of your internal congress. Immersed in these cultural and social dreams, internal cabals and vested interests completely drown out your inner compass. The water of the iceberg itself has no constituency; only the demands of the impurities in the water are heard. Your sense that your waking identity is in control and “running the show” is largely a myth. It has no control over endocrine, genetic, and autonomic nervous system functions, nor should it, because it lacks the intelligence to do so. Can you imagine what would happen if you consciously tried to digest your lunch? Do you known where, how, and when to release and when to hold back all those peptides and enzymes that your body does as a routine matter? At night your waking identity surrenders all control in deep sleep and generally experiences limited control and awareness in dreams. A little self-observation discloses that there is an ongoing rich, interior dream life that you neither control nor understand. Putting deep sleep and dreaming together, a full third of your life is out of your control most of the time. Regarding the other two thirds, you most likely did not control who you were born to, the cultural and social scripting that you received, or the conceptual environment that you grew up that largely determine who you think you are today. What you think you control is largely a perceptual delusion that you maintain to help you feel secure. While your waking sense of who you are creates many fictions to support this delusion, aging, social events, and external physical occurrences are largely out if your control. You are largely unable to control what other people think about you or whether there are hurricanes, fires, robbers, or accidents in your life. If you think you know who you are and that you are in charge of your life you are less likely to get into the uncomfortable role of victim in the Drama Triangle. Coming to grips with how little control you actually possess does not mean that you have to feel out of control, victimized, and vulnerable. This realization is a first step in gaining genuine control, paradoxically by sharing it with the other ninety percent of who you are. How can you ensure the rights of the ninety percent of the iceberg that lies below your level of waking awareness? In Integral Deep Listening this is accomplished in several ways. When you interview a dream aspect or the personification of a life issue, you are giving freedom of speech, assembly, and press to aspects of yourself. When you practice becoming this or that emerging potential during your waking life you are at that moment including the will of the governed in your attitudes and decisions. When you attempt to put into practice a recommendation by an interviewed dream character or personification of a burning life issue you are listening to a petition from your constituency and making it a law of the land. Instead of focusing on what is wrong with politicians and the power struggles of your world you are shifting your focus to what you can do to correct and maximize the power distribution between your waking identity and your internal or intrasocial community. This empowers you by integrating more parts of you into your waking sense of who you are. At the same time it reduces internal status discrimination, analogous to class distinctions based on money, wealth, family, and fame. You are doing a truly amazing, revolutionary thing: sharing your power to rule and control your life with your internal constituency. Jefferson believed that the way to limit governmental power while curbing the excesses of citizens lies in giving to others those rights that one wants for oneself. What would it mean to apply this principle in your own interior life? What if you were to treat your dream monsters, trees, cars, toothbrushes, and trash cans the way that you want to be treated? Years of work with Integral Deep Listening demonstrates that you will discover sources of support and direction within that will amaze you. You will access “virtuous” aspects of yourself that score higher than you do in core qualities of enlightenment: confidence, generosity, wisdom, acceptance, inner peace, and witnessing. These qualities will become the glue that hold together the entirety of the iceberg of your identity, just as Jefferson imagined virtue as the force that holds together a republic. This virtue will replace your normal sense of unknowing separateness from the life, concerns, and rights of your citizen constituency. The artificial sense of status that your waking identity maintains in its ignorance of who it really is will give way to a perspectival egalitarianism, in which different and differing rights and points of view are encouraged. This will shift your style of self-governance from waking autocracy or dictatorship toward a more democratic rule, in a way similar to how Jefferson envisioned virtue replacing the patronage, dependency, and coercion that held together the monarchies of Europe. Jefferson saw government as a conflict between independence and dependency, Protecting and encouraging the expression of the rights of your intrasocial constituency allows your personal political development to move toward a state Jefferson did not envision, interdependency. Just as the water in the ten and ninety percent parts of the iceberg are the same, so listening to and integrating the recommendations of your interviewed emerging potentials will allow growth into a self-sense that expands to include the whole of who you are. Although icebergs contain fresh water while the ocean that surrounds is salty, it’s all water. Jefferson believed that only those with property could escape the dependency that limits one’s ability to participate in representative government, and so disenfranchised women and slaves. Time has enormously broadened Jefferson’s understanding of rights and who is capable of exercising them in a responsible way. Similarly, IDL demonstrates that no aspect of who you are, known or unknown, is dependent in a way that disallows its full participation in your body politic. Consequently, IDL extends the rights your waking identity enjoys to all aspects of yourself and to all of your emerging potentials. Why is this so important? Those aspects of yourself that you do not include in your personal political process, that is, in your decision-making processes, form revolutionary cabals. These rise up as addictions or guerrilla movements to overthrow your waking government, either temporarily, as in drunkenness, fits of rage, or criminality, or permanently, as in psychosis, accidents, and death. The solution is diplomacy. Enter into dialogue with your rogue cabals. Enter into dialogue with your emerging potentials before they form powerful internal alliances based on common grievances. Many humans dream of the day when Jeffersonian liberties are extended to all people, everywhere. That would indeed be a great day, and many people spend their lives working to make that dream come true. But how many of those brave and virtuous souls extend those same rights to their own internal constituencies? How many understand, much less practice, intrasocial democracy? How many know what dream politics is, much less practice it in their own lives? For a moment let us imagine that this idea were to become wide-spread. What would that mean for the world? First of all, the fight for social justice in the world would be balanced with serious, daily efforts to implement intrasocial justice on a personal level. The result would be more healthy, integrated individuals with more energy, creativity, and resources to fight for social justice. Secondly, familial culture everywhere would be transformed. Instead of parents demanding obedience out of fear that their children will not learn the skills necessary to find work, have the financial success necessary to have a family and achieve personal happiness, they would trust that as they teach their children to find and follow their own inner compass that their own emerging potentials will teach them how to best deal with these social and cultural challenges. Third, because people will no longer experience themselves in conflict with their emotions or their bodies, they will not perceive their relationships with power as overwhelmingly conflictual. They will not put themselves at odds with the parts of themselves that political power structures, such as government, elected representatives, the media, or the wealthy may represent. They will avoid getting into political Drama Triangles. The result is that they will be playing the game of life at a level that transcends and includes fear-based drama. This means that the common tools that power uses to control the population, fear and greed, will lose their effectiveness. Such an internal shift in individuals, groups, and society is not the only way to accomplish social change, nor is it always the best way. However, if you change yourself you maximize your own chances for happiness while maximizing your ability to transform society by the power of the example of what you are doing and who you area becoming. Could this work? Is it really possible to transform servitude to power by freeing your own enslaved voices? To conduct this experiment and decide for yourself you need believe no one. You need trust in nothing exterior to yourself. Simply learn the IDL interviewing process, implement those recommendations that grow out of the interview that make sense to you, and see what happens. Make up your own mind. If you believe in human rights, prove you are a human by extending those rights you desire for yourself to your internal constituencies. Learn and practice dream yoga. Create the government you yearn for within your own heart and mind. Become a Thomas Jefferson to your own disenfranchised masses. How do you do so? Why not begin by getting to know the Thomas Jefferson within yourself? By accessing, listening to, and applying the recommendations of this powerful and important emerging potential within yourself you can make changes that matter, both for yourself and for the world. To view an example of such an interview, see Interviewing Thomas Jefferson.